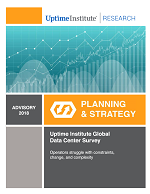 Abstract - The Eighth Annual Uptime Institute Data Center Survey provides an overview of the major trends shaping IT infrastructure delivery and strategy. The survey was conducted via email between February and May 2018 and includes responses from almost 900 data center operators and IT practitioners globally from enterprise and service provider facilities. Major themes in the 2018 survey results include data center efficiency metrics, edge computing, rack density, hybrid infrastructure, DCIM adoption rates, the impact of climate change on data centers and data center industry staffing and diversity trends.